When looking at the schedule of games last weekend, Miami hosting winless Florida International looked like one of the few games completely not worth watching, as both teams were unranked, the game was out-of-conference, and Miami was undoubtedly going to pound the in-state smaller school on the home turf. Little did anyone know that the pounding Miami gave to FIU would have nothing to do with football. The ramifications of this game are not yet clear, but most of the fallout has appeared to happen already in swift fashion. FIU suspended 16 players indefinitely, and Miami suspended 15 players for one game each (and Reddick indefinitely). Lamar Thomas was promptly shown the exit door and will not be a commentator perhaps ever again. When asked about the debacle, Miami coach Larry Coker said �this was just a bad day, and I have very few bad days.� The understatement and the lack of outrage from the university is appalling. Shouldn�t there be more punishment from the ACC or the NCAA in this case? 1. You can easily find footage on YouTube and other websites of Miami players in the past four seasons doling out late hits, unsportsman-like celebrations, and other dirty hits on the field of play under Larry Coker. 2. 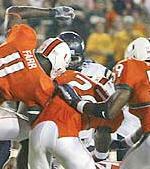 After losing 40-3 to LSU in the 2005 Peach Bowl, Miami players started a brawl with the Bayou Bengals in the tunnel after the game like sore losers. 3. Using style that makes Maurice Clarett look innocent, Miami players returned gunfire from an off-campus residence to other Miami thugs in the offseason. 4. Also in the offseason, a few players recorded a nearly-unbearable profane-laden song described in this ESPN.com article. 5. Before the big showdown at Louisville three weeks ago, Miami players rushed to the center of the field and stomped on it to enrage the Louisville players. Miami went on to lose that game too, 31-7, to a team missing two of its best offensive leaders. 6. And then the brawl on Saturday night, which required over 20 uniformed police officers to break up. Miami celebrated on their sideline by jumping up and down with helmets in the air, apparently over winning the fight or perhaps over beating such a great opponent. First, suspend all the players who participated in the brawl indefinitely or for the rest of the season, not just one game. It is embarrassing when Florida International is tougher on its players than you are, showing a lack of understanding how serious this problem has become. FIU has no reputation as anything other than a lower-level Division 1-A football school, and by taking tough action, FIU proves this conduct is not acceptable. If Miami truly wants to stay away from the �Thug U� label, the university should either suspend all of those players for the remainder of the season or kick them off the football team and make them walk-on next season if they wish to continue playing. The conduct was nothing short of assault and battery, and just because it happened on the football field does not mean we can excuse it with a one-game suspension, the equivalent of a wrist-slap. Second, decline any bowl invitation this season. This is what Clemson and South Carolina did to punish their players two years ago, and as a team I think this would be appropriate for the overall direction of the program. I do not think the other players who took no part in the brawl should be unduly burdened or punished by forfeiting every game left on the schedule, but suspending the players for the season as described in step one will obviously hurt Miami�s chances to win games for the remainder of the season. There is no reason to honor this team and athletic department with a bowl game and the money attached to that, so the university should kindly decline any such invitations come December. Lastly, fire Larry Coker and clean house in the athletic department. I wrote two weeks ago about how Michigan State�s John L. Smith and Coker were neck and neck to be the first fired in 2006 (or 2007), but now Coker has taken a commanding lead in this race to the pink slip. Coker�s initial reaction to the brawl to the media was, �I think this will affect the image of this program, but in a very positive way; this won�t be a negative for the University of Miami.� Coker also said, �I do have a grip on this program, don�t ever doubt that, don�t ever doubt that.� The above evidence shows that Miami is headed right back to their �Thug U� days, except without winning national or conference titles, so Coker is delusional if he thinks he has a grip on the program. Losing four games in a row at Michigan State and having a small verbal fight with Illinois when the Illini showed no class by planting their flag at midfield does not look good, but at least the Spartans did not fight rival UM in the tunnel after getting beat 31-13 or start a brawl with Ohio State when the Buckeyes were rolling to a 38-7 win this week. I would undoubtedly fire John L. Smith at the end of the season, but Coker should be fired immediately. The program is losing control on and off the football field, and someone more authoritative such as Butch Davis needs to be brought back in. I do not expect anything like Jim Tressel has going at Ohio State, with Christian values being taught to players and prayer circles after every game, win or lose. I do, however, expect every football power in Division I-A to be classy enough to conduct their business on and off the field in a positive manner. If things continue down this road, I would begin to look at more serious penalties, such as NCAA scholarship sanctions and maybe even the death penalty for the football program. We are not at that point yet, but these are possibilities if �Thug U� comes back in style in southern Florida. The most embarrassing program in major college football needs to be stopped before it brings shame on the rest of the sport. Now getting back to battles on the field, the top three games of the week begin with a Big Ten conference showdown as Iowa visits Michigan. The luster of this game has been dampened quite a bit with UM and Ohio State running away with the Big Ten (and Iowa�s shocking upset at Indiana last weekend), but make no mistake that Iowa has a chance in this game. Critical mistakes the Hawkeyes made against Ohio State (choosing to take the ball first in the first half and costly turnovers, for example) will need to be cleaned up for this game to be close. This is Michigan�s last �big� game before the showdown at Columbus, so I expect QB Chad Henne and RB Mike Hart (and perhaps WR Mario Manningham) to be ready to run all day over the conservative coverage of Iowa. Iowa obviously looked past Indiana to this game, so the question will be how they can respond to that embarrassing loss. I think Iowa QB Drew Tate plays the game of his life, but the talent of Michigan is just too much in the end. Michigan wins by 7. The second game of the week is a preview of a likely Big XII Championship game, Texas at Nebraska. Both teams are undefeated and lead their divisions, but both have lost early to national title frontrunners, Ohio State and USC. The Longhorns are on quite a roll, and only the vaunted Ohio State defense was able to hold them under 28 points. Nebraska is the best run defense unit Texas has faced since then, and RB Selvin Young and the Texas O-Line must step up to keep the pressure off QB Colt McCoy. Nebraska has a nice running game to control and quicken the pace of games, but Texas has a good enough offense to not care about fewer opportunities. If Nebraska makes Texas one-dimensional and gets out to a third quarter lead, the Cornhuskers might make this interesting. Texas will not pull away as easily as they did in the second half against Oklahoma, but the Longhorns will win the toughest game left on their schedule by a margin of 10. The game of the week is shockingly from the ACC, the much-maligned conference with nobody over-achieving this season (Wake Forest is that good). Georgia Tech visits Clemson in what might also be a preview of the conference championship game in December. Georgia Tech has a big lead in the Coastal division (effectively 3 games on everyone except Miami, who the Jackets have a 1 game lead over), while Clemson is mired in a virtual 5-way tie for the Atlantic division lead with Florida State one back in the loss column. The Tigers must hope Boston College loses another game or two for Clemson to win the division, and Tommy Bowden�s boys know they must win their last 4 conference games to truly make a run at a league title. Both teams have great offensive attacks, Clemson led by QB Will Proctor and RB James Davis and Georgia Tech led by standout QB Reggie Ball and WR Calvin Johnson. Clemson�s defense should be able to slow the Jackets down, while Georgia Tech is suspect against the passing game (which bodes well for CU). Other intangibles against Georgia Tech are the tough environment in Death Valley and the irrelevance of this game to their ACC title hopes (beating Miami next week would lock up the Coastal division essentially). Georgia Tech is looking forward to bashing Miami, and Clemson rolls on with a 14 point win. Every week, college football has been losing undefeated teams, and the number dropped from 9 to 7 last week (bye-bye Missouri and Florida). Will this be the first week the remaining undefeated teams hold serve? Rutgers could be a casualty this week, so keep an eye on their game with Pittsburgh. Have a great football weekend!